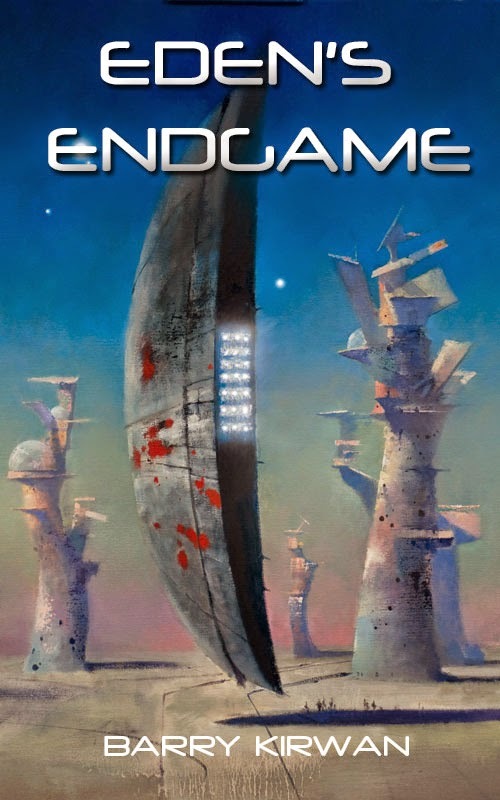 The fourth and final book of the Eden Paradox, Eden's Endgame, is going through a series of reviews - two editors and five readers - prior to publication. The first reader has just finished. Here's an extract on what he had to say. Me: So, how was it overall? Reader: It was good, in fact better than I expected, because after the last one I didn't think you could pull this one off! It was more ambitious than any of the others, but you did it, it worked. Me: How about the beginning? Reader: It starts with a kick, jumping back 50 years, to just before the third world war, back on Earth. That was nice, added a bit of depth to the whole series. Then it launches us straight back into the future, plunging us deep into the action with a great battle scene, and we see a new side to the Spiders we've not seen before. And you almost had me rooting for Louise. Almost. Reader: He's grown, though he still has some of his original faults, like he's still a bit clueless when it comes to women (laughs). Reader: You killed off my favourite, in fact, you kill off quite a few characters in the first half of the book. But when you killed xxxx, that hurt. I had to stop for a while. I didn't see how they could go on. Jen summed it up at that point when she said "We're totally screwed, aren't we?" Reader: You - well they - turned it around. Particularly the last third of the book. You saved the best till last, which doesn't often happen in scifi. Me: How was the end for you, the climax? Reader: Well, I could tell it was coming to a big battle scene. I was worried it would be space ships lined up against each other, like the space equivalent of a big brawl. But it didn't happen that way, and I thought, yes, this is how a real space battle would be fought. Clever what you did with the Kalarash right at the end, I didn't see that coming. Me: This is the last in the series. Did it feel that way for you? Reader: You know, seven chapters from the end I wondered how you were going to close it, it seemed impossible. But you did, those last few chapters, everything got resolved. And the Epilogue really nailed it, that was an unexpected bonus. I still wonder what happens with the Spiders, though, what they do next...? In about a week I get the first editor's review, a week later the second editor will give me his feedback. I already know from them there are some things to clean up, but nothing major. Then it goes to two more readers, one of whom, a SF writer, checks out my 'science'. Then it goes to a proofer, then to the publisher. Two things I'm going to add to Eden's Endgame are a 'Cast of Characters', as it's the fourth book, so it will help people who haven't read the others for a while, and a list of all the different ships used throughout the series, especially since by books 3 & 4 we're seeing what Iain Banks called 'Mindships', that are not only intelligent but also have their own character. In Eden's Endgame the ship Micah flies, called Shiva, definitely has her own mind, which is why she's the centrepiece of the front cover. The front cover is from a scene where Micah attacks the Alician homeworld, Savange.